We are a company that giving job opportunities has achieved excellent results so far, at this time we are in a exploration stage preparing the ground to present the results of our social and environmental studies, that way we ensure a safe, reliable and sustainable operation in Soto Norte province, Santander . The Minesa team works with enthusiasm, to achieve the results, we do things right from the beginning and we continuously improve through the innovation of our processes. Currently MINESA generates 629 jobs between direct and through contractors. 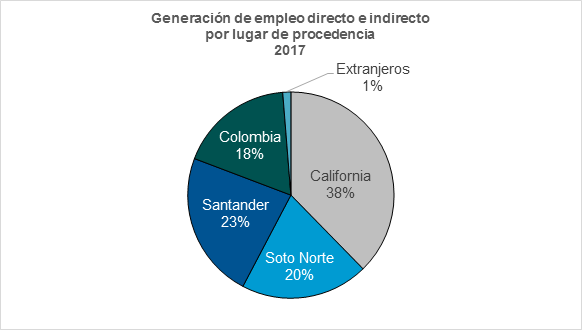 99% of the MINESA employees are Colombians. 81% of MINESA’s human talent is Santandereano. Although sending your resume does not guarantee that you will be hired by Minesa but for us it is very important to know you professionally and register your experience in our database, when there become vacancies available we will contact the selected applicants. If you want to be part of our company, send us your resume, you will automatically receive a response and it will be registered in our database.